John Smart in his Stanford Lecture "Understanding the Singularity" (5-20-2003) mentioned that there is a "Smart Cathy" doll ($300) that responds to a child's crying. It will perk up and comfort the child to stop crying. The original Chatty Cathy dolls were made by Mattel in the 1960's and can talk when a string is pulled. 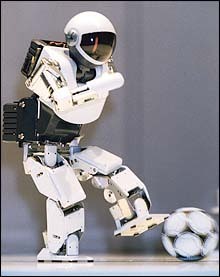 At MIT's Artificial Intelligence Lab, Cog and Kismet Robots are being developed that are social & embodied. But can Robo-Man laugh at our jokes and cry when our heart is hurt? Robokitty has video cameras for eyes, stereo microphones for ears and speakers for meowing. It also has touch sensors that will let it know when it is being stroked, so it can purr. It'll play with wool. If you pull its tail, it'll reach around to scratch. It'll run around and do hundreds of cat behaviors. But so far it hasn't caught any mice and needs a coat of fur. The Wolf of Gubbio is from Saint Francis of Assisi's Little Flowers of St. Francis, Chapter 21: How St. Francis Tamed the Very Fierce Wolf of Gubbio. The fierce wolf terrorized the town of Gubbio by devouring not only animals by even humans. St. Francis was able to tame the wolf and made it apologize to the townspeople. Can Robo-Man change the psyche of beasts to be peaceful the way a saint or sage can harmonize nature? Genno Shinsho (1329-1400), a Zen priest was summoned to dispel an evil dragon from a village pond. Atsutada, the lord of Kasuga castle erected a new Zen temple (Taikyuji) for Genno when the demons were cast away. Likewise, the poet Han Yü (768-824) recited his Address to the Crocodiles, threatening to shoot them with poison arrows, and chased these menacing beasts away from the Chaozhou riverbanks. Can Robo-Man play the role of a Shaman and cast away beasts of terror and evil demonic spirits? will they toil non-stop as our slaves for free. At what point will they strike and demand more pay? 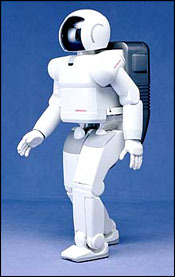 A Japanese dancing robot can follow a human dancer's lead. versions will be able to move in sync with humans. This couplet is not so much about the weather as spiritual contemplation. poking at the clouds with his caduceus in Botticelli's Primavera (1478). See Analysis of Painting and poem "Entering the Primavera"
Aaron, a robotic artist can produces paintings that could easily pass for human work (NY Times, 12-28-2000). If modern restorers of Titian ruined the original flesh tones of the Old Master, can a robot do any better? Can we detect any progress in style or technique in robotic art or is it totally randomized? For example, seeing Van Gogh's early charcoals of dark coal mining and his later paintings of luminous wheat fields and starry nights, we witness the progress of an artist from doubt to certainty. Van Gogh's sunflowers and wheatfields bathe us in sunlight. Can robotic art convey such emotions to us? Anthony O'Hear, "Art and Technology: An Old Tension"
Oman, an egg-shaped robotic poet & photographer can speak 7 languages. A.D.A.M. (Another Dimension of Artistic Manifestations) is a Random Poetry Generator by Nandy Millan. E.L.I. (Electro-Linguistic Imagination), a cyborg media cart, is programmed to generate random poetry from a text database. It's possible to fill a computer's memory with a rhyming dictionary, and it may even compose a sonnet or a haiku. But does Robo-Man have a command of metaphors, seeing similarity in differences the mark of a true poet according to Aristotle? Can Robo-Man write a poem like Dante's Commedia and illumine our mind and bring heaven to earth? Project Gutenberg on the Internet has 6267 books in its database (Nov. 2002), and one can imagine a robot with entire libraries scanned into its memory. Will Robo-Man be able to write an original novel, one that will enchant and enlighten us like Don Quixote, the Man of La Mancha who sings to us of "The Impossible Dream"?